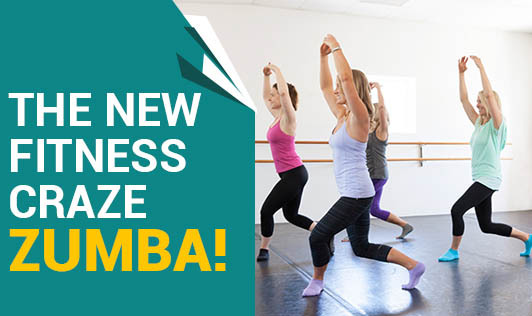 The New Fitness Craze - Zumba! This new exercise craze is taking the fitness world by storm. Instead of sweating on a treadmill or on an exercise bike, fitness freaks are toning up with the beat of Latin dance music in a type of choreographed dance routine called Zumba. Zumba, is an aerobic dance fitness routine set to South American beats, and is a brand new way of getting fitness through some fun. It's all about feeling the music, moving to it and letting it inspire you to a leaner and fitter body. Zumba helps achieve long-term health benefits while experiencing an absolute blast in one exciting hour. The routine features interval training sessions where fast and slow rhythms and resistance training are combined to tone and sculpt your body while burning fat. So what's in a Zumba recipe? Simple choreography: The basic essence of Zumba lies in its simple choreography. Like any other dance, Zumba is a wonderful mood elevator. It helps you let go of your inhibitions, and creates a sense of feel good factor, while helping you burn more calories. Fat and calorie burning: At its core, Zumba proposes to offer a large calorie burn through high aerobic activity coupled with interval training. Based on various factors such as body weight, gender, fitness level and other physical factors, you can burn up to 400 to 600 calories per hour. Zumba can kick-start your stamina, physical balance and muscle tone. Other Zumba benefits are, essentially the same as for any other good workout routine - reducing weight, lowering of blood pressure and increased bone density. Zumba fitness moves are quite effortless. Similarly, Zumba may also include several sets of squats and plyometric jumps - all this while you think you're dancing. A full body workout: Each Zumba class starts and ends with the standard warming and cooling through breathing and motion exercises. Zumba is a dance form merged with a fitness that touches on nearly every muscle and joint. Hips and abs are prime areas of focus, and flexibility also matters. Should you Zumba? Not all of us can stick to strength training and cardio workouts at the gym. But if you are looking for a fun filled exercise routine, you should Zumba! But remember, even a fun- packed workout won't help you get fit if you forget the first three rules of a good workout - be regular, stay motivated, and push yourself.